Spend more time this Passover enjoying family and traditions with this easy one sheet pan salmon and fresh vegetables meal. Put green beans, tomatoes, asparagus, baby carrots, leeks, red pepper and sugar snap peas in a large bowl. Add garlic, salt, pepper, red pepper flakes & oil – mix well to combine. Season salmon with salt, pepper and top with pesto. 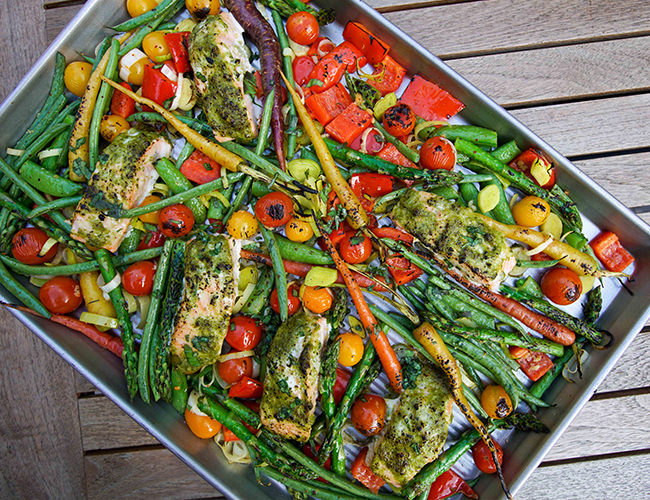 Place salmon among the veggies and put baking sheet into the oven. Cook 15 minutes, then turn to broil and cook for another 2-3 minutes or until salmon is nicely golden. Plate vegetables & salmon and top with chopped basil.